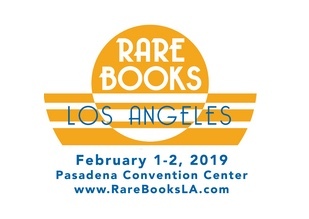 Booktryst makes its book fair debut at Rare Books Los Angeles, at the Pasadena Convention Center February 1-2, 2019. With many scarcities not seen in decades if not longer, and a gathering of books and prints that will have your eyes popping out of their sockets, our Booth 704 will definitely arouse your interest and may be the most provocative of the weekend. Please stop by and say hello. That is, of course, if you're not left speechless by what Booktryst has in store for you. I'll publish a partial preview tomorrow.